Well one week turned into two VERY quickly as the end of the semester lurks just around the corner. How has it already been 8 weeks? Week eight of Editorial Management consisted of our proofreading test so there isn't much to share other than my horrendous mistake of adding full stops behind Mr and Mrs in the UK. Who knew? I managed to correct my error before the test was over but I'm still a bit embarrassed over it. In Editorial Management in week 7, we covered budgeting and scheduling. While I've gotten the budgeting spiel from both Marketing and Production, it's nice to have this third lecture to see just how truly "incestuous" these three aspects of the publishing process truly are. An editorial schedule covers a book from the moment it is commissioned to the moment it is published. It takes into account time it takes to prep a manuscript, receive all the permissions and illustrations needed, book design, printing, shipping, distribution and publication. It is an all encompassing schedule whereas a production schedule only begins when a manuscript is handed over to production and a marketing schedule, while as long as an editorial schedule, exists as its own separate entity. However, all of these schedules come together to make up the life cycle of a book, which is pretty cool. I have a feeling I'm doing a piss poor job of explaining this so I'll just move on and pretend I'm not as tired as I feel. If you've been following my postgraduate adventures, you would've seen my gigantic marketing post a while back before my big marketing test (the first assignment of the year). I am pleased to announce that I got an 86% on the test and I am joyfully relieved to hear I not only passed, but passed with first class marks. Take that, marketing! On another note, the deadline for our marketing plan assignment (the BIG one...) is looming in the near future and so the past two weeks have been focused on teaching us how to create marketing plans. Basically, if you follow that structure, you'll turn out something usable. Just remember that the most important thing about a plan is to be specific. You should be able to hand your marketing plan off to a random person and they should be able to understand and implement your plan without you having to explain anything. Oh yes, my favorite part of the week! I'm just totally in love with the design aspects of my degree (and wonder if I should've just taken a design course instead? Eh. Too late now!!) This week we turned in our first major assignment for this course and it was worth a staggering 50% of our grade for the class. It was a big deal. 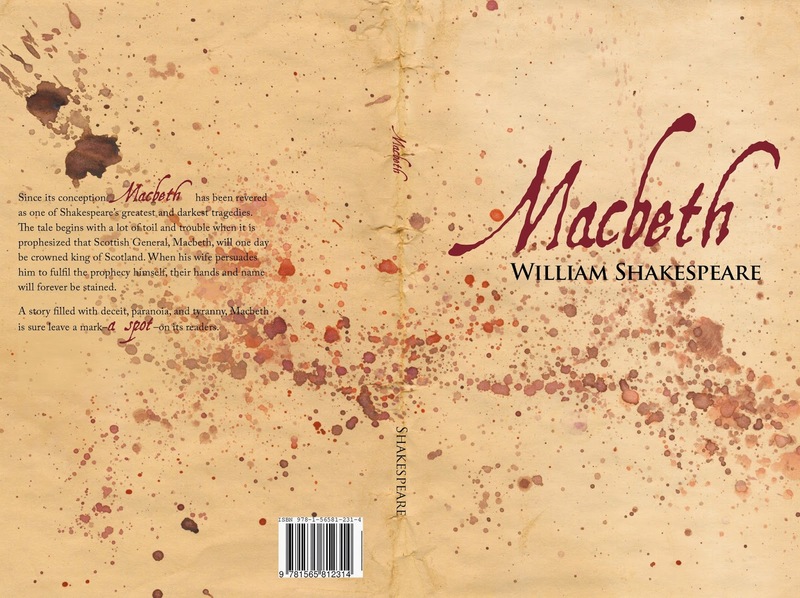 The assignment was to create a preface and a cover for a Shakespeare play of our choice. We were given the text but were tasked with designing the layout of the book. The kicker was that all of our images had to be scanned in from books/magazines/etc so no internet images were allowed... Because of this I decided to create my own artwork to go onto the cover and it turned out so magnificently I swear I nearly jumped up and down when it came of the printer. Since I've already turned in the assignment, I figured I could go ahead and share the cover with you because I'm MEGA proud of it. Granted, it's not perfect because I'm just a beginner but I think it's pretty damn good. In addition to panicking over this assignment, we've been learning the basics of XML (but not actually learning to do it... so I'm planning on learning pretty in depth over Christmas break between the semesters) as well as some pretty nifty InDesign tricks. I'm pleased to say my InDesign lectures have picked up pace and each week I leave with some fantastic new tricks to play around with. I'm loving it. Anyway, here's to week 9! Only three more weeks until the end! How is this real life?